As a Christian who attended a secular school, The University of Kansas, I wish I had read this book sooner. Nothing I encountered on campus was sufficient to undermine my faith, but I often didn’t know how to answer the accusations atheists threw out, as if they were reading from a predetermined list. I never thought about how to dismantle an atheist’s position. That’s where Norman Geisler and Daniel McCoy’s book, The Atheist Fatal Flaw, could have changed my experience. The premise of the book is surprisingly simple and surprisingly profound: use atheism to refute atheism. In order to do so, the writers analyze the primary atheist objections to God, beginning with the problem of moral evil and the value of human autonomy. The bulk of the book is spent explaining the atheist positions. In doing so, the writers display an impressive knowledge of the cannon of Atheist writers, including Darwin, Freud, Nietzsche, Dan Barker, Christopher Hitchens, Richard Dawkins, and many others. Whatever your beliefs, you have to admit the authors are well read. Throughout their writing Geisler and McCoy highlight how many of the atheist positions contradict each other. For instance, atheists fault God for allowing moral evil while simultaneously condemning any interference in their lives that might threaten human autonomy. As the writers reveal, these kind of self-contradiction accusations run throughout atheism. After introducing the premise, the book focuses on specific points of controversy: Submission and favor, death and faith, guilt and rules, etc. Each chapter unpacks the arguments while using them to point out how one atheist pillar defeats another, even though atheists sometimes hold both beliefs concurrently. 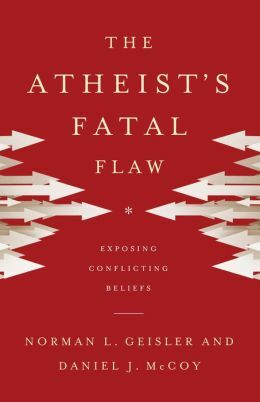 The overall writing style of The Atheists Fatal Flaw is academic—which I consider in some ways to be the book’s biggest flaw (of course, I say this as someone who majored in Creative Writing not literature). While the plethora of quotes certainly builds the writers’ position, it does not build their ethos with the reader in the same way hearing more of the writers’ voices would. In my experience, atheist writing tend be wrought with hubris, which makes the voice difficult to like or relate to. As someone who is personally acquainted with one of the writers (Daniel McCoy), I would have enjoyed finding more of his warm and amusing personality in the writing. Overall though, I finished my reading of The Atheist Fatal Flaw rather struck that refuting atheism could ultimately be so simple and that I never saw it before. Aside from bolstering my faith, this is a book that enabled me to see some of the gaping logical holes in atheism. It was definitely worth the time and money I invested.